Comments for What does the self help author/Mirror Man say about Perception of Others? Helping people to re-mind themselves to re-member and BE who they really are! I am so grateful for exploring your blog essentially and directly. Bless you! Where is mirror man's reply? This question is really intriguing and deep. I cannot find the reply/answer to it...I'd love to read it! Join in and write your own page! It's easy to do. How? Simply click here to return to Questions to the Self Help Author. 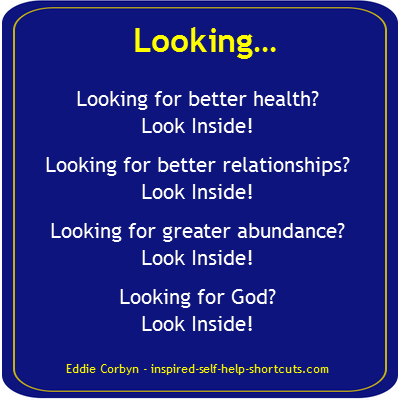 Return to What does the self help author/Mirror Man say about Perception of Others?. If you found this page helpful please like and share. Thank you. Think of it this way, if you’re not playing the leading role in this game of your life, then you’re probably playing a bit part in the game of someone else’s life! Find A Self Help Web Directory Or Resource! Choose a self help web directory that is easy to use. Links to directories that are edited by humans! A Confidence Self Help Test To Identify Your Soul Mate! A confidence self help test to gain awareness and confirm your preferences. Dissolve the barriers that are keeping your soul mate from you!